Wing span: 1 1/8 - 1 5/8 inches (2.9 - 4.2 cm). 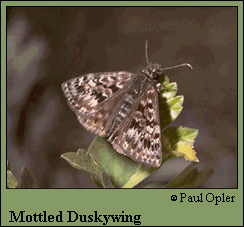 Identification: Upperside: Brown background and irregular dark bands contribute to the mottled appearance of both wings. Freshly-emerged butterflies have a purplish iridescence. Male has a costal fold containing yellow scent scales; female has a patch of scent scales on the 7th abdominal segment. Life history: To wait for females, males perch and patrol on ridges and hills during the day, sitting on the ground or on tips of twigs. Females deposit eggs singly on the host plant. Fully-grown caterpillars hibernate. Flight: Two broods from April-September. Caterpillar hosts: Wild lilacs including New Jersey tea (Ceanothus americanus) and redroot (Ceanothus herbaceus var. pubescens) in the buckthorn family (Rhamnaceae). Adult food: Nectar from flowers of bush houstonia, gromwell, hoary vervain, and other plants. Habitat: Open woodland, barrens, prairie hills, open brushy fields, chaparral. Range: Massachusetts and southern Ontario west across the Great Lake states to Minnesota; south to South Carolina, the Gulf Coast, and central Texas. Isolated populations in eastern Wyoming, eastern Colorado, and western South Dakota.